Yes, she built it herself! 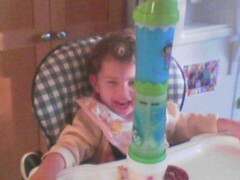 A budding Frank Lloyd Wright? "1 And the whole earth was of one language, and of one speech. 2 And it came to pass, as they journeyed from the east, that they found a plain in the land of Shinar; and they dwelt there. 3 And they said one to another, Go to, let us make brick, and burn them thoroughly. And they had brick for stone, and slime had they for mortar. 4 And they said, Go to, let us build us a city and a tower, whose top may reach unto heaven; and let us make us a name, lest we be scattered abroad upon the face of the whole earth. 5 And the Lord came down to see the city and the tower, which the children builded. 6 And the Lord said, Behold, the people is one, and they have all one language; and this they begin to do: and now nothing will be restrained from them, which they have imagined to do. 7 Go to, let us go down, and there confound their language, that they may not understand one another's speech. 8 So the Lord scattered them abroad from thence upon the face of all the earth: and they left off to build the city. 9 Therefore is the name of it called Babel (confusion); because the Lord did there confound the language of all the earth: and from thence did the Lord scatter them abroad upon the face of all the earth."